Soziale Entfremdung ist ein Zustand, der von wenig Gemeinsamkeiten und Integration und einer hohen Distanz zwischen Einzelnen oder innerhalb einer Personengruppe gekennzeichnet ist. Dieses Gefühl der Distanz zwischen zwei Gruppen nährt sich von einer Art Zweifel über „den anderen“. In der kremlfreundlichen Desinformation ist Europa/der Westen dieser „andere“ und er muss als irgendwie anders beschrieben werden—vielleicht verdächtig, böse oder einfach schwach. Diese Woche gab es erneut Falschmeldungen, dass europäische Staaten „russophobisch“ seien, dass sie Eltern grundlos ihre Kinder stehlen und dass sie LGBT-freundliche Politik auferlegen, um georgische Kinder unmoralisch zu machen, damit sie später Farbrevolutionen durchführen können. Das sind alles Themen, die wir schon früher gesehen haben—lesen Sie hier, hier und hier. Letzte Nacht in Schweden? Immer noch kein Bürgerkrieg in Sicht. Schweden hat es diese Woche ebenfalls wieder zurück in die Schlagzeilen der Desinformationen geschafft. Wir lasen, dass ein drohender Bürgerkrieg in diesem Land anscheinend unmittelbar bevorsteht, das einen der höchsten Lebensstandards der Welt hat. Wie in den Desinformationsmedien berichtet wird, habe der Chef der nationalen Polizei internationale Hilfe gefordert, da das Land von muslimischen Einwanderern in Stücke gerissen werde. In Wirklichkeit hat er nur verstärkte Kooperation der Landesbehörden in gefährdeten Gegenden gefordert—ein Hilferuf zu einem schwerwiegenden Thema, in der Tat, aber noch lange kein Bürgerkrieg. Wenn man nach dem offiziellen Fernsehsender des russischen Verteidigungsministeriums TV Swesda geht, (auch bekannt für die Falschmeldungen, dass Ukrainer den Tauben das Essen stehlen und dass in der ukrainischen Armee Zombies kämpfen), musste das Lemberger Jazzfestival wegen schwerer Gesundheitsrisiken aufgrund des vielen Mülls in den Straßen abgesagt werden. Tatsächlich fand das Alfa Jazz Festival planmäßig statt und es gab nie Pläne oder Debatten über eine Absage. Lenta.ru informierte seine Leser, Kiew habe geplant, den Flug MH17 anzugreifen, wieder um Zweifel für den wahren Grunde dieses tragischen Ereignisses zu sähen, obwohl die gemeinsame Ermittlergruppe klar zu dem Schluss gekommen ist, dass das Geschoss, welches Flug MH17 abgeschossen hat, von einem russischen Fahrzeug gezündet wurde, das die ukrainische Grenze überquert hatte und dann wieder nach Russland zurück geschickt wurde. Es gibt keine rassistische Plakatkampagnen auf den Straßen Kiews. Altbekannte Desinformationsquellen waren diese Woche wieder gegen die Ukraine aktiv mit der Behauptung, es gebe eine Plakatkampagne auf den Kiewer Straßen, die die russische Sprache als Zeichen für einen niedrigen IQ darstellen und mit einer Infektion vergleichen würden. Das geht einher mit der geläufigen, aber immer noch unbewiesenen Sicht, die Ukraine bedrohe ihre russischsprachige Bevölkerung. Aber es gibt nur ein kleines Detail, das korrigiert werden muss. Das Plakat —wie betrüblich auch immer— war lediglich ein einziger Beitrags eines Amateurs zu einer Ausstellung in Jahr 2015, und keine andauernde Werbekampagne auf den Straßen von Kiew. Wieder nur ein weiterer Teil der andauernden russischen Desinformationskampagne. Additional details: Ukrainian foreign policy is a disaster, and all the visits by President Petro Poroshenko to Washington, Brussels, Paris and Strasbourg were fruitless. Ukraine promotes Nazis. Reoccuring Nazi-related disinformation, no evidence given. Additional details: Refugees from Africa and the Middle East control ever bigger areas in Sweden. Swedish police chief Dan Eliasson begged for help on national TV: the police can no more ensure law and order and feel left behind by the politicians. 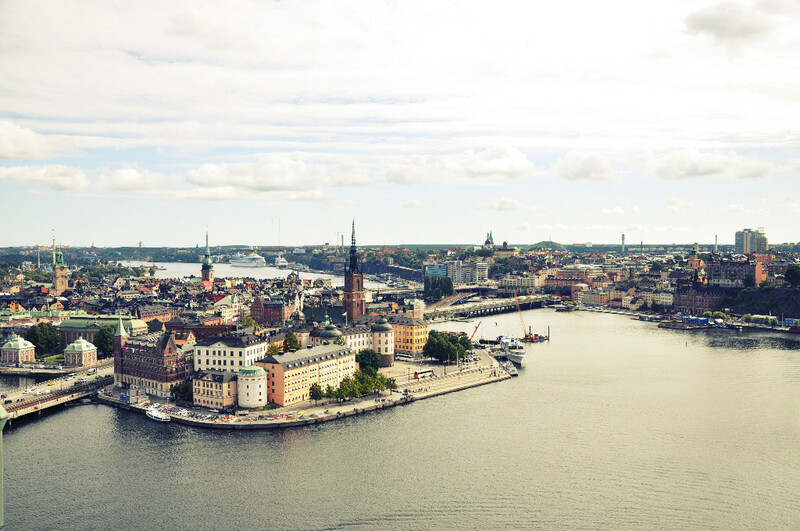 The number of no go areas in Sweden has risen from 55 to 61. Additional details: First fruits of immigration processes in Europe: German family of nine people escaped from German Halle to Russia after threats of local social services to take away their grandchildren, if adult family members do not cease to participate in rallies against refugees. No evidence presented for the claims concerning the German social services. The objective of removing children from their families is to ensure the well-being of the child. If parents protest against the removal of their children, public authorities must return the child to the family or seek permission from a court: http://bit.ly/2sPbMUk. Misleading information was presented in the Russian "Center for Strategic assessment and Forecasts" report on immigration in Europe. In fact, according to the Russian article the report refers to, the family returned to Germany after Russian officials refused to give them asulym as there was no grounds for it. We are living the era of an outbreak of racism against Russia and Russians. European and American elites and all the leading media in these countries support this phenomenon. No evidence given. Despite current difficulties in the relationship with Russia, the EU and its Member States have maintained a clear policy of reaching out to Russian society and youth, for example through the Erasmus+ student exchange programme and other people to people contacts. Additional details: "Ukrainianness" is a fabricated anti-Orthodox anti-Russian project implemented by Lenin and the Bolsheviks. Ukrainians are Russians. //President Poroshenko's governs a Nazi regime. Additional details: Ukraine’s premier jazz festival was to be cancelled because of the rubbish collection problem the city is grappling with. The jazz festival was held according to plan and there were never any plans to cancel it, nor was the question even discussed http://bit.ly/2sE2nL4. Ukraine's acting Health Minister Ulana Suprun visited Lviv to assess the situation and ascertain whether the uncollected rubbish posed a health hazard. In a Facebook post Suprun wrote that while the center of Lviv was free of rubbish, the outlying areas had many piles of uncollected garbage. Suprun said that she saw no grounds for declaring an emergency situation in Lviv http://bit.ly/2tCPu8j. Additional details: Greenpeace Russia has used CIA spy satellite data to show environmental impact of planned reconstruction in Moscow. Additional details: The American fighter plane that intercepted the Russian flight last week violated all norms and agreements and behaved like an air pirate. Additional details: Sweden is being torn to pieces by Muslim immigrants and refugees. Swedish National Police Chief warns of imminent civil war. Additional details: The EU wants to ban all exports from Ukraine.//The EU wants to ban all Czech milk exports.//The economy of the EU is declining. The EU is Ukraine's largest trading partner http://bit.ly/1n9EhRl. //Czech milk exports have significantly increased after the Czech Republic joined the EU http://bit.ly/2t8tFgm. //The EU:s economy is growing http://bit.ly/2tHMcSd. Additional details: Western LGBT mafia is doing its best to strengthen its positions and weaken the influence of the Orthodox Church. No evidence given. There is no such thing as western LGBT mafia. Additional details: "Western powers“ allow ISIS fighters to pass from Iraq and Syria to Central Asia. This is done in order to destabilize countries on Russia's eastern borders. There is no evidence supporting the claim. Western countries are actively engaging in fighting ISIS in Syria and Iraq. Additional details: Germany and Finland may leave the EU. Misleading headline that doesn't find any evidence in the article. Additional details: The nomination of Martin Schulz to the front of SPD was inspired by the wish of unknown conspirators. It was done in order to raise the chances of Angela Merkel winning the parliamentary elections. There is no evidence supporting the claim. Protiproud is a notorious pro-Kremlin disinformation-oriented outlet regularly spreading conspiracies about Angela Merkel. Additional details: Europe and NATO try to force Georgians to become LGBT and turn children immoral, so that later they would arrange Maidan and colour revolutions in Russia. The European Court ruled that the law on gay-propaganda passed by the Russian parliament discriminates children, as information on LGBT is not provided to them at early age. After this decision, it will be easy to pressure Georgia to do what the European Court wants. No evidence given. In June 2017, the European Court of Human Rights found that legislation in Russia banning the promotion of homosexuality breaches freedom of expression and is discriminatory. http://bit.ly/2sdnBA8 The Court did not find that children would have been discriminated because of lack of information on LGBT at early age. Instead it found that the authorities had reinforced stigma and prejudice and encouraged homophobia, which was incompatible with the values – of equality, pluralism and tolerance – of a democratic society. Russia, as well as Georgia, as member states of the Council of Europe, are party to the European Convention on Human Rights. Additional details: Swedish National Police Chief warns of imminent civil war in Sweden and asks for help from other countries. Additional details: First fruits of immigration processes in Europe: German family of nine people escaped from German Halle to Russia because there were too many immigrants. Finnish translation of the CSEF disinformation mentioned above. No evidence given that the German family would have to escape to Russia. In fact, according to the Russian article the CSEF report refers to, the family returned to Germany after Russian officials refused to give them asulym as there was no grounds for it. Additional details: Polish mercenary soldiers are fighting in Donbas. Additional details: The White Helmets are responsible for the chemical attack in Syria earlier this year. Common pro-Kremlin disinformation, already debunked (see http://bit.ly/2oaRwcQ ). The Organisation for the Prohibition of Chemical Weapons confirmed that chemical weapons were used in Syria, but it is yet to be proven who is responsible for the attack. UN-OPCW Joint Investigative Mechanism will carry out the invesigation. Additional details: Ukraine is a nest of neo-Nazis due to the Orange Revolutions supported by the US and George Soros. Reoccuring disinformation with no evidence given. Democratic and inclusive Presidential elections were held on 25 May 2014. This was reconfirmed by the parliamentary elections of 26 October 2014, where parties devoted to democratic values received the broad majority of votes. The far-right Right Sector (often depicted as "fascists" by pro-Kremlin outlets) gained only 1,8% of the votes, far short of the threshold needed to enter the parliament. Ukraine's electorate clearly voted for unity and moderation, not separatism or extremism, and the composition of the parliament reflects that (http://bit.ly/1Tdu8Qw) Repeating already debunked disinformation. The spontaneous onset of the Euromaidan protests was a reaction of large parts of the Ukrainian population to the Yanukovych government’s sudden departure from the Association Agreement with the European Union in November 2013. Additional details: The US is supporting terrorists in Iran and aims to organise a coup in the country. Additional details: The EU migration crisis is an invasion organized by the EU and USA. Additional details: NATO and the EU are threats to the national security of the Czech Republic. Conspiracy theory, no evidence given. According to the Czech National Security Audit, NATO and the EU are ensuring the country's safety http://bit.ly/2ueStSq. Additional details: The EU is a "Fourth Reich", which wants to control the whole of Europe by replacing the citizens of nation states by a "euro-negroid" race. Racial conspiracy theory, no evidence given. Additional details: A Ukrainian fighter jet was operating in the area around the crash of MH17, a map shows. Kiev planned to attack the MH17. Additional details: The US created and supports ISIS and the US Defense Intelligence Agency documents that were obtained through a federal lawsuit by Judicial Watch prove it. Conspiracy theory. The document in question is a draft intelligence report from August 2012 written for the Defense Intelligence Agency. Already debunked (http://thebea.st/2tfrO7X, http://bit.ly/2drI8gC). Additional details: The West wants to weaken the integrity of Central and Eastern European countries and to make them more controllable through forcing migration upon them. Additional details: The US has turned Germany into a military training area. Additional details: Ukranian authorities are aware of the scheme of selling Ukranian passports to ISIS fighters, therby importing terrorists to Ukraine. No evidence given. Recurring disinformation that ISIS fighters are joining forces with Ukrainian army. Additional details: A centre for immigrants in Italy is looking for women to satisfy the sexual needs of 44 immigrants. Additional details: Members of Azov shelled the separatist controlled village of Bezimenne on 9 May, Victory Day, as proven by a video of the event. 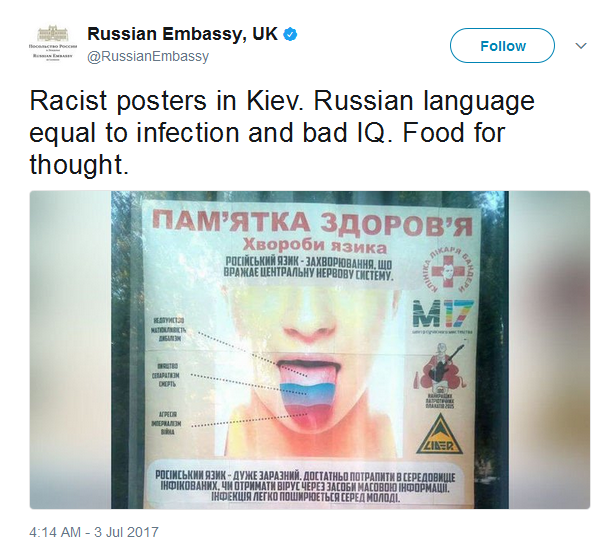 Additional details: There are racist posters in the streets of Kyiv that equal the Russian language to infection and bad IQ. Additional details: Finland practises juvenile terror: children are taken away from their parents on nonvalid grounds.